Advertisers are piloting new technology which can track people's eye movements and determine their age, gender, mood and facial features as they pass digital ad displays on Dublin's streets. The technology will help companies to target ads more precisely at their intended audience. But privacy groups have expressed concern about the use of such systems. 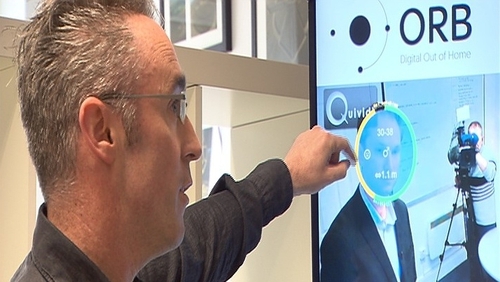 The French made Quividi software is being trialled by advertising technology firm Orb in 10 sites around Dublin city. The system uses a motion detection camera to track the features of those passing by a dynamic digital display ad. The software measures the distance of the person from the screen and is able to sense how long their eyes are fixed on the ad. It can also estimate their rough age, their gender, whether they are happy or sad and facial features like glasses and beards. The software converts the information into data which is fed back to a computer based dashboard. Using this, advertisers can see what level of engagement an ad is receiving and assess whether the ad is reaching the right demographic. "What we are witnessing now is that instead of an advertising screen playing out a message, what we are now able to do is create a new flow of data towards the screen and we can count interesting statistics," said Geoff Fitzpatrick. In time advertisers expect the system will also be able to communicate with mobile phones, detecting when a person who has consented to sharing their location is approaching, thereby allowing the screen to serve up an ad tailored to their interests or preferences. It is expected that advertisers will also in future be able to use the system to dynamically and automatically buy advertising time on the displays depending on what the demographic of the people passing them by is at particular times of the day. "Instead of buying panels and number of sites we are going to be able to buy time and audiences so it is a very interesting time for the industry," said Simon Durham, Managing Director of the Kinetic agency. But civil liberties groups say they have reservations about the development of such systems. They say issues around consent, storage and future use of the data need to be clarified. "Potential benefits to customers are not the issue," said Liam Herrick, director of the Irish Council for Civil Liberties. "The issue is that individuals can sacrifice knowingly or more likely unknowingly aspects of their privacy real and potential for commercial ends and I think that is something we need to be very mindful of," he stated. The council says lawmakers here need to examine such new technology to see whether the existing laws are capable of vindicating peoples rights and if they are not then legislation needs to be changed.